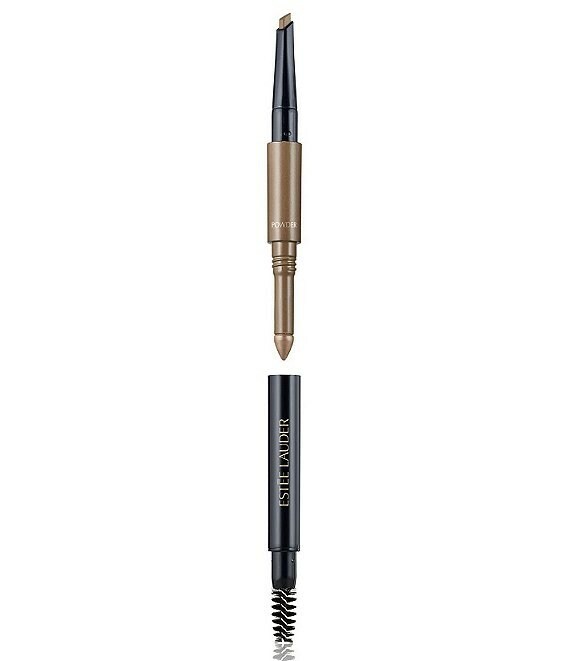 Sculpt, shape and define your arches with this innovative 3-in-1 brow tool. On one end, a unique triangular tip fills and contours brows with a custom thin or thick stroke. In the center, a sponge-tip applicator primed with brow powder creates fullness and depth. Style and set your brow look with the spooled brush. Groom: Brush brow hairs up and out using the spooled brush to assess natural brow hair pattern. Fill: Fill in using pencil. With brush, sweep color out and downward to shape the arch and elongate the tail. Set: Using brow powder applicator, lightly press sponge tip over length of brow to set pencil and add dimension.